The World Bank’s 2015 report on the role of Latin America and the south in global priorities highlighted that the traditional north-south hierarchy is changing, and with it assumptions about trade and finance. The last 40 years have seen the south’s share of global trade increase by a half to 51 per cent, with this figure predicted to rise to 64 per cent by 2030. While China takes the lion’s share, a few countries in South America and the Caribbean are also major players in the new global trade order. One aspect which may be holding many countries back, however, is lack of access to credit that allows for exportation. Some empirical studies on the relationship between credit constraints and exports show that businesses with fewer credit constraints are more likely to export (e.g., Berman and Héricourt, 2010), while others find that exporting improves businesses’ financial health (e.g., Greenaway et al., 2007). There are several reasons why a company’s ability to export may be seriously affected by its access to credit. First, there are entry costs that need to be paid prior to both exporting and receiving any revenues from export activity. Second, there is a larger delay between production and payment for sales to international markets than domestic sales. Third, there is a higher risk of not being paid for international sales. Our recent study focused on export patterns in the manufacturing industry in Chile between 1995 and 2002 in order to examine whether access to credit increases the likelihood of engaging in export. 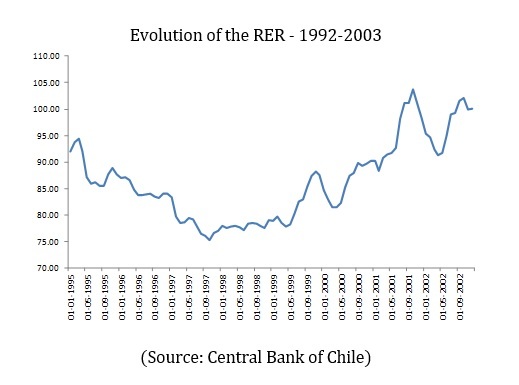 During the latter part of the period studied (1992-2003), the real exchange rate (RER) suffered a significant depreciation, which should have increased the profitability, and thereby the attractiveness, of exporting. The specific manufacturing plants we studied did not engage in export activity before the depreciation in RER. We separated those manufacturing plants into two groups: those who had access to credit and those who did not, and predicted that the plants with access to credit should have been more likely to take advantage of the RER depreciation experienced by the economy between 1999 and 2002 by opting to participate in exportation of their products during this period. We also exploit financial differences across industries by using a measure of external financial needs while employing the identification strategy pioneered by Rajan and Zingales (1998). We expect that an increase in the RER should raise the probability of exporting relatively more on firms with access to banking debt operating in industries more financially dependent. Our results have shown that RER depreciations do increase the probability of exporting for companies with access to banking finance and, in particular, for companies in industries with higher financial needs, such as wood products and furniture in the case of Chilean exports. This is consistent with findings from theoretical literature that state exporters may need more credit than firms selling purely in domestic markets. The repercussion of this evidence for the region demonstrates that policy makers should consider the importance of providing support in accessing financial markets for those companies engaging in export markets. It also demonstrates that RER depreciation has heterogeneous effects depending on whether companies have access to credit, although further research may be required to explore other sources of heterogeneity of companies’ responses to changes in export profitability, such as innovation and the mix of exported products. Alvarez, R. and R. A. López (2014). “Access to Banking Finance and Exporting,” Industrial and Corporate Change, 23(6), 1523-1539. Berman, N. and J. Héricourt (2010), ‘Financial Factors and the Margins of Trade: Evidence from Cross-Country Firm-Level Data,’ Journal of Development Economics, 93(2), 206-217. Greenaway, D., Guariglia, A. and R. Kneller (2007), ‘Financial Factors and Exporting Decisions,’ Journal of International Economics, 73(2), 377-395. Rajan, R. G. and L. Zingales (1998), ‘Financial Dependence and Growth’, American Economic Review, 88(3), 559-586.